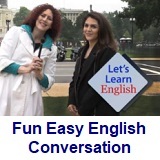 ﻿ Fun Easy English - new american english standard conversation Voice of America VOA learning English for intermediate lesson 27 Fish out of Water discourse. 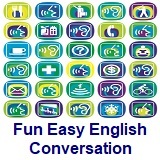 In this lesson Anna visits a friend on her houseboat. She says she wants to live on one. But, is that really a good idea? MS. WEAVER: Oh, Anna. I’ve invited some people to dinner Saturday. We’re going to that new seafood restaurant -- Fish on a Dish. MS. WEAVER: Why don’t you join us? My treat. ANNA: Thanks, Ms. Weaver. But I already have plans. My friend has invited me to her houseboat. MS. WEAVER: Houseboat, really? That’s unique. ANNA: Yes, it is. In fact, I’m thinking of living on a houseboat. MS. WEAVER: Aren’t you too tall and klutzy to live on a houseboat? ANNA: I am not too tall! PROF. BOT VO: Is Anna really ready for a houseboat? PROF. BOT: For example, Ms. Weaver said, “Why don’t you join us? 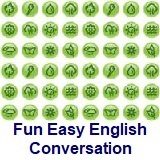 My treat!” That’s: Why don’t plus the subject plus the simple form of the verb. PROF. BOT: Anna responded to the invitation by saying, “Thanks, but I already have plans.” Keep watching for more examples of informal invitations! FANNY: Anna, I’m so glad you could come! FANNY: Hi, this is my son, Phoenix. FANNY: How about you give Anna a tour and I will make some lunch? ANNA: Do you really call her “captain”? PHOENIX: I kind of have to. ANNA: So, Phoenix, I think I’d like to live on a houseboat. Do you like living here? PHOENIX: I love it! It’s much different than living in a house. ANNA: Oh, I bet. I bet you had to get rid of a lot of stuff, didn’t you? PHOENIX: No way! We moved from a 3-story house to a boat! So, we really had to downsize! ANNA: I’d have to get rid of a lot of stuff. I have a rock collection and I have some really big rocks. ANNA: Can you stop this boat from rocking for a minute? PHOENIX: No. We’re floating on water. I can’t do that. ANNA: Well, since you live on the water, aren’t you afraid of great white sharks? PHOENIX: No, not really. They don’t live in these waters. ANNA: … that you know of. What about killer whales? FANNY: You know, Anna, if you’re afraid of sea life, maybe you shouldn’t live on a houseboat. Do you have any boating experience? ANNA: Oh, oh yeah, Fanny. I have battled the great waters before -- once on a swan boat and once in a duck boat ... bus. It was a boat that turned into a bus. FANNY: Yeah, I don’t think that counts. ANNA: Fanny, does this rocking ever bother you? FANNY: No, I love it. It goes up and down and side to side and up and down. Anna, I love it! FANNY: Anna, are you feeling okay? ANNA: Yeah, yeah. You know, I just need some fresh air. FANNY: Let me open a window for you. ANNA: No, I need some fresh land air. I mean, I need to breathe air on land. Oh, is that the time? I should really be going. ANNA: Thanks for lunch, Fanny, and a tour of your houseboat. It’s given me a great idea! FANNY: You’re going to live on a houseboat? ANNA: Sort of. Thanks again! ANNA: Hi! How would you like to hang out on my boat? Great! See you then! ANNA: …and this is my shark net. MS. WEAVER: Thank you for the invitation, Anna. ANNA: Of course, would you like more orange juice? ANNA: (to young man) Ahoy! Try making invitations! 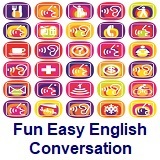 Invite someone to an event or activity. Use the language you learned today. Write your invitations in the comments below. For example: Why don't you come to gym with me? Thanks, but I already have plans. We also used many contractions -- the short forms of words. Find the contractions and write their meanings in the comments below. Or, just tell us what you think of the lesson. We'd love to hear from you! Write to us in the Facebook comments section below.